Apparently the sunniest place in Denmark, Bornholm's mild climate, laid-back atmosphere, and sandy beaches, together with its many walks and biking trails have nurtured a lively tourist trade. 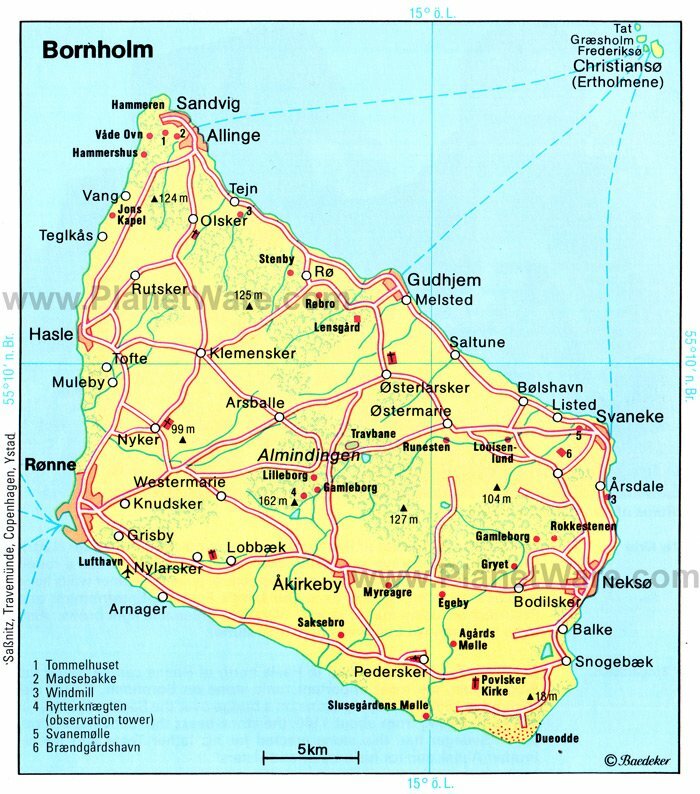 Bornholm lies in the Baltic, 47 kilometers off the Swedish coast and roughly 150 kilometers from Copenhagen. The interior of the island is partly wooded and part heathland. On the north of the island, you'll find breathtaking, steep cliffs and sea stacks. On the southeast and western fringes, sand dunes and fine long beaches await. The coastal strip near Dueodde is particularly popular. Bornholm also boasts a reputation for excellent salmon and cod fishing as well as fine stocks of sea trout. However, all anglers between the ages of 18 and 65 require a fishing permit for both freshwater and ocean fishing. Ferries run to the main port, Ronne, from Copenhagen and the German port of Sassnitz. You can also fly from Copenhagen, which takes around 35 minutes. If you head south along the coast for 23 kilometers towards Allinge-Sandvig, one of the most attractive resorts on the island, you'll pass by Hammeren Lighthouse. Strategically placed on a rocky plateau to the southwest of the lighthouse are the ruins of Hammershus Castle, built around 1250 for protection against marauding Danish kings. The fortress was violently fought over on several occasions and then sadly used as a quarry until placed under a preservation order in 1822. Magnificent views beckon from the adjacent cliffs. Boat trips take visitors to nearby sites, including the Våde Ovn, a 55-meter-long cave. The walk along the footpath to Slotslyngen woodland is considered to be one of the most beautiful and dramatic in Denmark. This architecturally cutting edge museum opened in 1993 and is considered to be one of the finest in Denmark. Occupying an enviable spot with panoramic ocean views across to Christiansoe, the museum houses magnificent collections with works by artists such as Edvard Weie, Karl Isakson, Olaf Rude, Kræsten Iversen, Niels Lergaard, and Oluf Høst, all providing fine examples of modern Danish painting and the decorative arts. There are also sculptures and earlier works, making this Denmark's largest collection of arts and crafts outside Copenhagen. There's a great café where you can sit back and admire not only the art, but also the terrific landscape. This fascinating museum has a collection covering seafaring history and the natural history of Rønne and Bornholm with granite, limestone, coal, and kaolin specimens. The history of art department features works by local Bornholm painters as well as drawings and examples of the decorative arts, including Viking pieces. The museum also houses several interesting artifacts, such as wartime memorials, old clocks, and items of gold. Children will love the seafaring section decked out as a ship. Also under the umbrella of the Bornholm Museum are Hjorth's Factory, Erich's Farm (both in Ronne), and Melstedgård Agricultural Museum south of Gudhjem. To the northeast of Bornholm lies a group of islands called Ertholmene (Pea Islands), which can be reached by boat from Allinge, Gudhjem, and Svaneke. On the main island of Christiansø are extensive fortifications installed by Christian V in 1684. When the port lost its importance as a naval base in the 19th century, it became something of a magnet for poets and artists. The neighboring island of Frederiksø was once notorious as a place of exile; its most interesting building is the Lille Tarn (Little Tower), now a museum with a 17th century model of the castle on Christiansø, rifles, cannons, old furniture, and utensils. Though closed to the public, Græsholm is home to a bird sanctuary. Although Bornholm's coastline is stunning, inland is equally delightful. Around three kilometers from the busy port of Nexo, you'll find the privately owned Hills of Paradise (Paradisbakkerne), interestingly also known as The Hills of Hell (Helvedesbakkarne). This is a treasure trove for hikers and mountain bikers with rocky soaring landscapes, narrow valleys, and lush forests to explore. Park at Lisegaard and set off on your adventure. The iron-age stronghold of Gamleborg and the Rocking Stone (Rokkestenen) are well worth seeing. There's a youth hostel and various marked trails to follow. On the northern tip of Bornholm are the twin resorts of Allinge-Sandvig, one of the most attractive holiday locations on the island (Sandvig means sandy bay). Tømmehuset, at Vestergade 3 in Sandvig, houses a little local museum, and Allinge is home to a number of attractive half-timbered houses; an interesting old Town Hall; and a church, the oldest parts of which are Gothic. Outside the cemetery in Allinge lies an obelisk in memory of Russian soldiers who fell in the Second World War. Many quaint old farms can be found in and around the area. Around ten-minutes' drive southwest from Ronne is the most recent and best preserved of the distinctive round churches of Bornholm in the tiny village of Nylars. The interior of the church has wall paintings depicting the Creation and the Fall of Man. In the porch, there's a huge cross dating from Renaissance times. 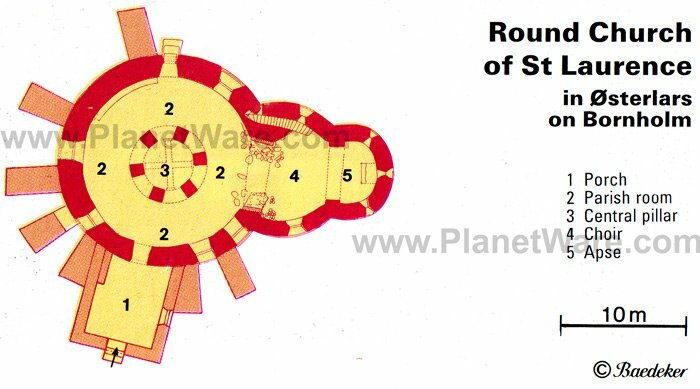 Interestingly, the church was not only built as a place of worship, but also served a defensive role. The origin of the church dates back to 1165. A northerly drive of a little more than 13 kilometers from Ronne brings you to Hasle, a little port that is home to a sturdy 14th century stone church, Nykirke, with a half-timbered tower. The beautifully carved and painted winged altar is the work of a Lübeck artist and dates from around 1450. South of the town, a sandy beach lies beyond some picturesque pine woods, while seven kilometers to the north, a stretch of steep granite coastline features a crag known as Jons Kapel (John's Chapel), which is 40 meters in height. Held in mid July, the annual Herring Festival includes a parade, a fair, food and drink stalls, a craft market, and plenty of dancing and singing in the streets. To the south of Allinge, the sea is fringed with cliffs along which winds a rocky path. Places of note include Sandkås, Tejn, Stammershalle, the Helligdom, Stevelen cliffs, and the quaint fishing village of Gudhjem. The harbor is blasted out of the rock, and numerous winding lanes and steep streets crisscross the town. Tourist attractions include the Municipal Museum, housed in the former station building, and the open-air Melstedgård Agricultural Museum, around three kilometers to the south of the village in a half-timbered farmhouse typical of those on Bornholm. The Balticum Film & TV Festival usually takes place here in May or June. A six-kilometer drive south from Gudhjem is Osterlars village and another round church of the same name. This is the largest round church on the island and was built in the 11th century and dedicated to St. Laurence. The central pillar is hollow with internal ribbed vaulting. The space inside, known as the "oven", is joined to the rest of the nave by six arcades. On the exterior of the "oven", frescoes dating from 1350 portray scenes from the life of Jesus and the Last Judgment. When the church was restored in 1955 the oven was converted into a baptistery with a granite font. Around 120,000 people visit here annually.